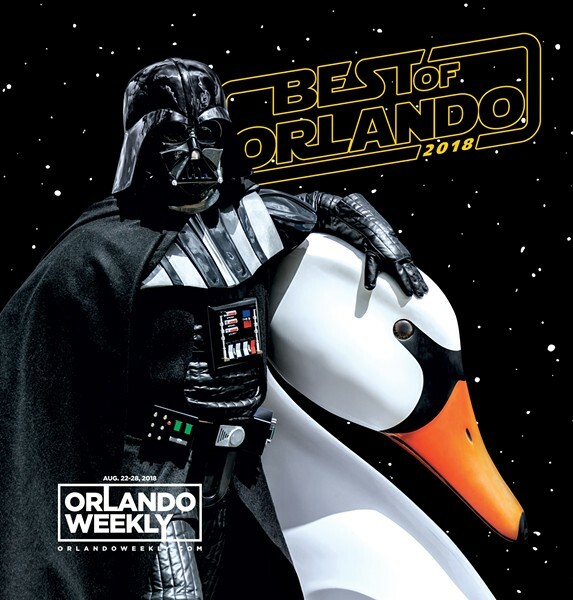 A long time ago (well, May 16) in a City Beautiful, all of the stars geared up to fight a war ... a war to see who was the Best of Orlando. And now the people of Orlando have spoken! Read of their triumph on the following pages, where we list the victors in the many battles of Local Color, Music + Nightlife, Food + Drink, Arts + Culture, Sports + Recreation and Goods + Services. Writers: Tyler Barney, Monivette Cordeiro, Faiyaz Kara, Seth Kubersky, Kyle Eagle, Bao Le-Huu, Thaddeus McCollum, Matthew Moyer, Xander Peters, Colin Wolf and Jessica Bryce Young ate, drank, danced, looked, learned and listened their way through the city for the past year to cull our Writers' Picks. Editors McCollum, Moyer and Young also took on the herculean task of tallying our voters' voices in the Readers Poll. Locations: Many, many thanks to the proprietors of Orlando Meats, Shots Bar, TopGolf, WestArt District and Woof Gang Bakery & Grooming Conway for allowing us to shoot our section openers in their establishments. Digital: ... and Colin Wolf uploaded all of it to the website. The stars of our issue this year are the cosplayers, without whom none of it would have been possible. Endless gratitude to you, Rebels and Imperials both. Who are you? I am Ashley Kitzman-Ortiz Ball, born in Oahu, Hawaii. I attended the University of Central Florida, where I earned my bachelor's degree in hospitality. Costume designing is my life's passion. When I am not working on my latest creation, I help out as a seamstress with local theaters and enjoy being an entertainment professional throughout Florida. I love my friends, I crave a great brunch and I always keep an eye on the future. Why do you love Star Wars? My mother had a huge love for Star Wars. So naturally, as a child I was introduced to the fantasy worlds of the movie franchise. Luckily I was to be old enough to understand it and to attend the first theatrical showings of the second trilogy, The Phantom Menace. I have to be honest, I fell in love with the costumes more than anything – Padme Amidala especially caught my attention. Star Wars and its multitude of amazing characters and costumes fired my passion to want to create and wear them. The older I grew the more I loved the overall story and never ending characters from which to emulate. What is your favorite thing about Orlando? I love that Orlando is always filled with unique events and themed parties, it's never boring. I meet so many amazing people from all over that are just as weird as me. How did you get started in cosplay? Like any child growing up, I wanted to wear the costumes that my favorite characters on the big screen were wearing. It wasn't until my mother taught me how to sew that I realized I could make my wants a reality. I picked up the skills and made things that I always wanted. My first cosplay creation was Tia Dalma from Pirates of the Caribbean, and after wearing it to my first MegaCon in 2007, I was hooked. I love my attention to detail; I normally make costumes that are very detail-oriented and difficult to do. Who are you? I'm Kevin Ball, a Hollywood stuntman who has spent much of my adult life doubling famous actors and pretending to be characters created by professional writers. Though the movie world pays the bills, my second passion is working with global humanitarian organizations. I have been on location in over 30 countries across the world advocating for NGOs in the areas of human trafficking, humanitarian landmine removal and children's surgical missions. Why do you love Star Wars? I saw A New Hope with my father in 1977 when it first came to theaters. I was 7 years old. Its stories and toys defined my young mind and became a permanent fixture of my adult life. To this day, over 40 years from the films release, I still collect items from the franchise, and I'm excited beyond belief to see new generations of Star Wars fans get lost as I did, in the "Galaxy Far, Far Away." What is your favorite thing about Orlando? I'm a native to Orlando. As a teen I hoped to move away from my home like many youthful people do, but age brought wisdom to my young mind. Orlando is a cultural melting pot of ideals, passions, arts, food and love. I have traveled across the country and across the globe and have yet to meet our town's equal. How did you get started in cosplay? Simply stated, my wife introduced me to it. It is an opportunity to shed your everyday image and to don a persona that can remove you from your normal routine. It's adult dress up, and it's fun. Who are you? Sam Falco, filmmaker, prop builder and costumer. Why do you love Star Wars? Star Wars for me is the pinnacle of what fantasy can provide. It whisks you away to an entirely different world full of bizarre and amazing things that both delight you and, at the same time, challenge you. What is your favorite thing about Orlando? My favorite thing about Orlando is easily the culture. There's just an overwhelming sense of artistic liberty in this city that few other places have. You can drive down the street and see gorgeous graffiti art that has been left in place for years and become a staple of the community. Theater, film, painting, music, it's all embedded into this town, and that's fantastic to be part of. How did you get started in cosplay? I got started in cosplay as a result of my endeavors into filmmaking, I think. I would make props and costumes for projects I was working on, and really get a kick out of the stuff but I never had a place to showcase them. When I discovered the convention scene, though, that gave me this amazing opportunity to meet other artists like myself and actually show off this stuff I loved to make. It sort of just snowballed from there. Who are you? I’m Doug Merritt, Chosen One Cosplay (Instagram: @chosen1_cosplay) –husband, father, friend. Why do you love Star Wars? I grew up watching the original trilogy. I always loved the story and depth of the Darth Vader character. What is your favorite thing about Orlando? Its diversity and creative spirit. Who are you? My name is Aaron Barnhill. I am originally from Nebraska and moved to Orlando in 1984. Why do you love Star Wars? I love Star Wars for its action, adventure, romance, betrayal, and good triumphs over evil. I also love the toys that Star Wars produced, and how it affects lives in different ways: Like for me, Star Wars and the Southern R2 Builders gave me the inspiration to build a life-size R2-D2. What is your favorite thing about Orlando? Disney for one, and how much diversity Orlando has. How did you get started in cosplay? Well, R2 isn't cosplay [Barnhill isn't inside the R2-D2 suit; he runs it by remote control]. It is more of a hobby that brings smiles to everyone.